Are there those among us whose senses extend beyond the natural range of perception? So-called mediums or psychics? Or are these people simply charlatans preying on the gullible and simple-minded? A number of articles appearing in the Marion Star in the 1890s specifically addressed the legitimacy of local séances. The articles centered on the Woods residence, located on the corner of Fairground and Park Street (though which corner is not clear). This house was apparently the best place to take part in a séance in Marion at that time. This photo, by Leon Isaacs, depicts British medium Jack Webber during one of his so-called trumpet speaking séances. Webber claimed that the white material attached to the small ends of the trumpets was actually ectoplasm. Similar trumpet speaking séances also took place at the Woods residence in Marion. 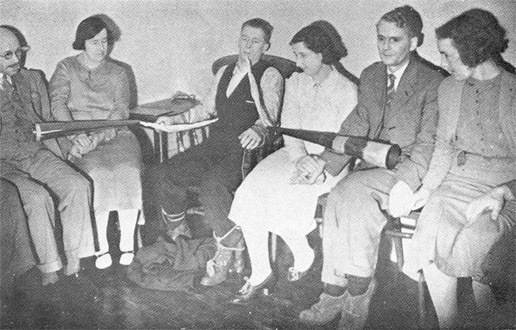 Mr. Lem McClaid, a medium from Ashley, conducted the séance, which involved a phenomenon called trumpet speaking. * McClaid instructed the three women and nine men form a circle and hold hands and begin singing. “Finally,” the Star writer notes, “one of the trumpets commenced to circle around the room tapping first this one then that and giving [me] an extra whack, evidently recognizing…a rank skeptic.” Soon after, voices began to emanate from the trumpet, and for the next two and a half hours, the group listened as the dead spoke to them. Members of the departed included an Egyptian who had been dead for 30,000 years, an Irishman “brogue and all” and, perhaps most surprisingly, a couple of dead locals, including one Robert Kerr. This picture, which appeared in the November, 1925, edition of Popular Science, shows Harry Houdini demonstrating how mediums could manipulate trumpets even when their hands were being held down. Of course, even in the 21st century, there has been no shortage of unscrupulous people who are willing and able to convince others of their supposed supernatural abilities. Case in point: according to a Marion Online article appearing on December 1st, 2008, Sherry Stevenson, a Marion woman claiming to be a psychic, allegedly convinced a mentally-deficient Colorado man to give her $30,000. In exchange for the money, she had promised him that certain parts of his life would improve. Police later charged Stevenson, who held psychic readings out of her 372 S. Main St. home, with fourth-degree felony theft after the Colorado man’s concerned relatives contacted them. There are mediums known as “trumpet mediums,” whose specialty is the production of voices, etc. thorough a trumpet, these voices often being recognized by sitters as characteristic of their departed friends, as giving information previously unknown to them, etc. In the vast majority of cases, the trumpet talking is done by the medium himself. If the séance is in the dark, the medium’s task is an easy one, he having only to wave the trumpet about and imitate whatever voices he desires. By attaching a trumpet to the end of the telescopic rod…and moving this about, voices can be made to appear in various parts of the room at will. Sometimes the trumpet is partly in sight, when the room is only partially darkened, and yet the voices come. This is accomplished by a small piece of rubber tubing being attached to the mouth of the horn, and the medium speaks into the other end of this tube. The voice appears to issue from the horn. At other times the medium employs a second trumpet, speaking into that, and it is almost impossible to distinguish the difference by locating the sound. At other times the medium consents to be held by two sitters while the horn is doing the talking. When this is the case, the medium generally has a confederate, who manipulates the horn, does the talking, etc. Incidentally, not all of the séances conducted at the Woods residence involved trumpet speaking. An article appearing in the Star on March 6th, 1896, describes how two mediums from Cleveland, Mr. and Mrs. Lindy, conducted a ‘light’ séance (i.e. they kept the lights on during the séance).